Dr. Smith's ECG Blog: Pulseless ventricular tachycardia – why did the AED not advise a shock? Pulseless ventricular tachycardia – why did the AED not advise a shock? This case was submitted by my friend Dr. Victoria Stephens. She is a third year Emergency Medicine Registrar from at the University of the Witwatersrand in Johannesburg, South Africa, and a great asset to FOAMed. Follow her on Twitter: @EMcardiac. A rhythm strip recorded from lead II. A wide complex tachycardia is present with a rate of approximately 170 BPM. The QRS duration is very wide. It is regular and monomorphic and all but diagnostic of VT. The code blue team recognized that the rhythm was ventricular tachycardia and that immediate defibrillation was required. They waited for the AED function on the defib to recommend a shock. Instead, it kept saying “…analysing…analysing”. No shock was advised. The doctor could not remember how to operate the manual mode of the AED defibrillator (this was an defibrillator that has an AED mode; not all defibrillators have that). Since the AED was not advising a shock, he assumed that the defibrillator was faulty, and called for another defibrillator to be fetched from the ED. CPR was continued, adrenaline and amiodarone were given. By the time the second defibrillator arrived, return of spontaneous circulation (ROSC) had occurred. The patient converted into a normal sinus rhythm a short while later. What happened? Why did the AED not recognize such an obvious case of VT? Was the defibrillator faulty? No, the defibrillator was not faulty. The technology is, rather, imperfect. The automatic external defibrillator (AED) was initially designed to be used by laypeople or first responders with little or no experience in defibrillation, in order to improve survival from out-of-hospital cardiac arrest (OHCA) (1). The AED uses a Rhythm Analysis Algorithm (RAA) which essentially is software that is programmed to discriminate between shockable and non-shockable rhythms. The RAA then prompts the AED to advise or not advise a shock. The RAA uses up to 18 internal algorithms to determine if a rhythm is shockable or not; the most important of these are: 1) heart rate, 2) QRS width and 3) QRS amplitude. With regards to VT, the RAA is programmed to recognize VT as shockable only at certain heart rates. For most AEDs, this heart rate is above 150 BPM (2). The rationale for this is twofold; 1) to prevent lay people from potentially defibrillating a perfusing VT in a patient who may still have a pulse, and 2) that patients are more likely to arrest from VT at heart rates greater than 150. How does the manual defib work? There is no RAA. The healthcare provider decides if the rhythm is shockable and whether a shock is advised. The number of joules for each shock is also set by the operator. When can the RAA in the AED fail? a. Pacemaker spikes and internal cardioverter defibrillators can cause artifact, interfering with the RAA function. b. Motion artifacts caused by chest compressions, handling of the patient, movement during ambulance transportation, breathing and seizures may also interfere with the RAA. 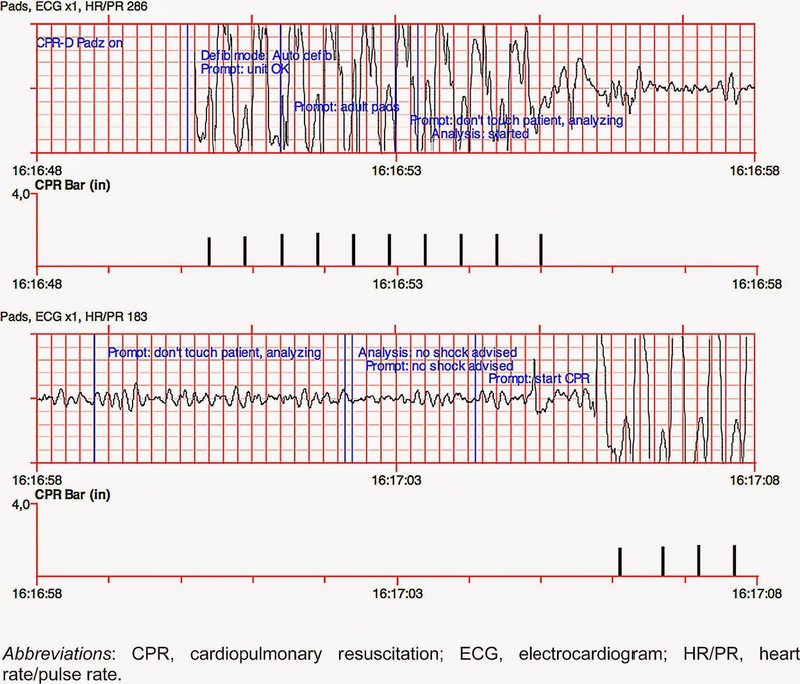 Below is an example where external artifacts occurred at the beginning of the AED analysis. (3) The AED incorrectly advised no shock for this case of coarse VF. This is an image of coarse VF. The AED incorrectly made a "no shock advised" decision. Several studies have examined the accuracy of the RAA by downloading the ECG strips and responses advised from the AED memory module. (3-5) These studies showed that the AED is more accurate in correctly detecting VF than VT; the AED being 100% specific and 95% sensitive for coarse VF. AEDs have also demonstrated similar accuracy in correctly detecting non-shockable rhythms such as PEA, normal sinus rhythm, supraventricular arrhythmias and asystole. The AED is much less reliable however, in correctly detecting VT: the sensitivity for VT ranged from only 63% to 83% in these studies, indicating that in several instances no shock was advised when VT was actually present. Inconsistent shock advisories have also been demonstrated for polymorphic VT, including the subtype Torsades de Pointes. One AED advised did not advise shock for any of the Torsades rhythms it was subjected to(!)(2). Several authors have recommended that manufacturers improve their algorithms and that physicians should be aware of the potential pitfalls in their use. Multiple studies have shown that the AED is very accurate at detecting VF and tends to advise a shock nearly 100% of the time. AEDs have been shown to reduce mortality in cardiac arrest, especially in OHCA. The AED similarly recognizes sinus rhythms, supraventricular rhythms and asystole reliably. The AED is far less accurate at determining VT; with regards to both the monomorphic and polymorphic forms. If the AED fails to recognize the VT, the VT will eventually degrade to VF which subsequently the AED is more likely to recognize. However, this delay may result in significant harm to the patient’s outcome as time to defibrillation is crucial to survival. With VT arrests, the trained healthcare provider is superior to the AED. For those staff who have a defibrillator with both manual and AED modes, they should know how to recognize VT, or probable VT, use the AED, and, if using the defibrillator in AED mode, know how to switch to manual mode. 4. Performance and error analysis of automated external defibrillator use in the out-of-hospital setting. JL, Weinstein C. Ann Emerg Med 2001;38:262-267. Nice case, thanks for sending this in, Victoria. Nice summary as every Steve! Interesting to see the internal report from the AED - I don't think we download these as often as we should. The defibs that have the option of an AED mode that I've seen are very user-friendly - from off turn the dial anti-clockwise to AED mode, clockwise for an energy level (and thus manual mode). Not all dedicated AEDs have an override though (and some that have the option have this disabled). I've always liked the HeartStart ones that have a small screen with two buttons to the right of the screen. Pressing them simultaneously lets you go into manual mode, handy either for this sort of scenario!